All content included on this site, such as text, graphics, logos, button icons, images, audio clips, and software, is and remains the sole property of the Chevrolet Car Club of Victoria Incorporated and is protected by Australian and international copyright laws. The compilation (meaning the collection, arrangement, and assembly) of all content on this site is the exclusive property of the Chevrolet Car Club of Victoria Incorporated and is protected by Australian and international copyright laws. All software used on this site is and remains the sole property of Chevrolet Car Club of Victoria Incorporated and protected by Australian and international copyright laws. Reproduction, modification, distribution, transmission, republication, display, or performance, of the content on this site is strictly prohibited. This site or any portion of this site may not be reproduced, duplicated, copied, sold, resold, or otherwise exploited for any commercial purpose that is not expressly permitted by the Chevrolet Car Club of Victoria Incorporated. This site is provided on an “as is” basis. The Chevrolet Car Club of Victoria Incorporated makes no representations or warranties of any kind, express or implied, as to the operation of the site or the information, content, materials, or products included on this site. To the full extent permissible by applicable law, the site owner disclaims all warranties, express or implied, including, but not limited to, implied warranties of merchantability and fitness for a particular purpose. The Chevrolet Car Club of Victoria Incorporated will not be liable for any damages of any kind arising from the use of this site, including, but not limited to direct, indirect, incidental, punitive, and consequential damages. Advertising, links to third party websites and e-commerce offers. The Chevrolet Car Club of Victoria Inc. Website contains hyperlinks and other pointers to Internet websites operated by third parties. These linked websites are not under the control of the Chevrolet Car Club of Victoria Inc. and the Chevrolet Car Club of Victoria Inc. is not responsible for the contents of any linked website or any hyperlink contained in a linked website. The Chevrolet Car Club of Victoria Inc. provides these hyperlinks to you as a convenience only, and the inclusion of any link does not imply any endorsement of the linked website by Chevrolet Car Club of Victoria Inc. or its affiliates. You link to any such website entirely at your own risk. The Chevrolet Car Club of Victoria Inc. Website also contains third party advertisements (including banner ads and other advertisements) which contain embedded hyperlinks or which include referral buttons to websites operated by third parties or their licensees or contractors. All third party advertising (including referral buttons and embedded hyperlinks) is paid for by the relevant third party advertisers and are not recommendations or endorsements by the Chevrolet Car Club of Victoria Inc. or its affiliates or their respective directors or employees. You are referred to the relevant advertiser for all information regarding the advertiser and its products and/or services. In some instances, the advertisement will contain representations or offers by the third party advertiser which you can accept by linking to the advertiser’s website and executing the relevant transaction. 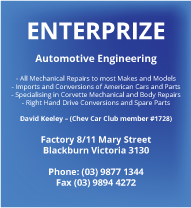 Such offers are not made by the Chevrolet Car Club of Victoria Inc, and the third party advertiser is solely responsible to you for the delivery of any goods or services you purchase on or through use of the third party website.